Sergio Garcia held off a late challenge from Shane Lowry to win his third successive Andalucia Valderrama Masters at the end of a weather-ravaged week in southern Spain. Garcia took out the tournament with a four shot victory after the event was forced into an extra day and also reduced to 54 holes due to the numerous storm delays throughout the week. Garcia shot a 2-under 69 for a 12-under total at the Real Club Valderrama, with Irishman Lowry storming home with a final round 66. “It’s amazing to be able to win here at Valderrama three times. It’s a dream come true,” said Garcia regarding his 15th European Tour victory and 33rd worldwide. Garcia is the first player to win the same tournament three times in a row in Europe since Colin Montgomerie at the Volvo PGA Championship from 1998 to 2000. 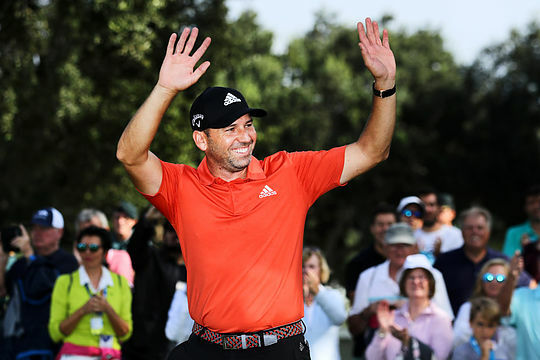 Garcia’s last European Tour win was at this event in 2017, and was the last of three victories that season, following the Omega Dubai Desert Classic and the US Masters. The Spaniard also has four top tens this season, with a best previous finish of T7 at the WGC-Mexico Championship and Portugal Masters. Lowry got as close as one shot off the lead after a round that included seven birdies, yet he was not able to close the deal on the inward holes. Yet it was good news for the Irishman with his second 2nd place finish moving his Race to Dubai ranking to 43rd and with a jump in his world ranking to 70th. Lowry was outside the automatic top-60 on the Order of Merit who qualify for the DP World Tour Championship in Dubai next month prior to this tournament. His inclusion will go some way to making amends for losing his full PGA Tour card for the 2018/19 wraparound season. Finland’s Mikkp Korhonen finished in 3rd position at 6-under. Aussie Jason Norris had his best finish this season on the European Tour with a share of 8th to be the top Australian. It was a fine result for the South Australian who became a European Tour winner with victory in the Fiji International in 2017. Norris has struggled this season having played in 27 events and made the weekend just eight times. Morris’ previous best finish this season was a tied 27th result at the China Open. Jason Scrivener was 22nd at even par, with Marcus Fraser a shot behind in a share of 29th position. Andrew Dodt was at 2-over for a share of 42nd position, with Wade Ormsby at 3-over and in a share of 52nd. Scott Hend rounded out the Aussies making the cut with Adam Bland missing the weekend.